BRUGGOLEN® C25 by Brüggemann is an activator for anionic polymerization of AP-NYLON® Caprolactam. It slows down the polymerization process in a much more controlled manner. It facilitates the production of parts with large dimensions and/or small wall thicknesses as well as the production of high-quality composites. It offers the possibility during product development of filling parts slowly in order to be able to optimize processes. 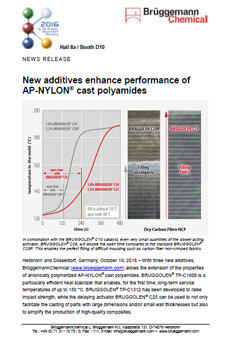 BRUGGOLEN® C25 is used for developments for AP-NYLON® cast polyamides. Recommended dosage level is 0.5 - 2.5 wt%. The shelf life is at least 12 months.